This morning, Lack Group’s Executive Traffic Manager, Peter, held a training session with our Traffic Controllers on how to operate E-Stops on the Pacific Motorway Upgrade in Northern NSW. 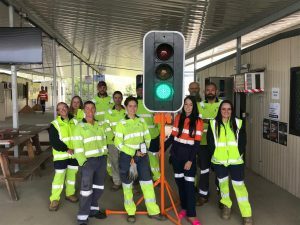 E-Stops are a remotely activated set of traffic lights that not only create a safer environment for our Traffic Controllers, but also for the public and road users. Our commitment is to get our personnel off the road and out of the line of fire.